Original Editor - Karolyn Conolty, Kenny Bosmans, Juliana Doyle,Alisha Lopez, Bilitis Crokaert as part of the Vrije Universiteit Brussel Project. Disorders of the hip labrum is an umbrella term that includes any issues involving that labrum such as femoroacetabular impingement (aka FAI) and acetabular labral tear (ALT). This mechanically induced pathology is thought to result from excessive forces at the hip joint. For example, a tear could decrease the acetabular contact area and increase stress, which would result in articular damage, and destabilize the hip joint. Amber and Mohan (2018) proposed that the term "fissure" is a better alternative to labral tears, at least in patients over the age of 40, in order to prevent overdiagnosis and unnecessary medical intervention. The hip (acetabulofemoral joint) is a synovial joint formed between the femur and acetabulum of the pelvis. The head of the femur is covered by Type II collagen (hyaline cartilage) and proteoglycan. The acetabulum is the concave portion of the ball and socket joint. The acetabulum has a ring of fibrocartilage called the labrum that deepens the acetabulum and improves stability of the hip joint. 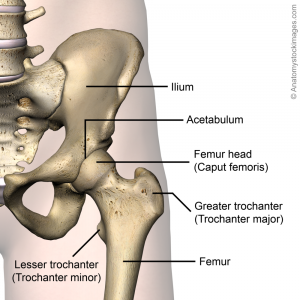 For a more detailed review of the anatomy of the hip, please see the Hip Anatomy article. The labrum of the hip is susceptible to traumatic injury from the shearing forces that occur with twisting, pivoting and falling. Direct trauma (e.g. motor vehicle collision) is a known cause of acetabular labral tearing.Additional causes include acetabular impingement, joint degeneration and childhood disorders such as Legg-Calve-Perthes disease, congenital hip dysplasia and slipped capital femoral epiphysis. While most tears occur in the anteriosuperior quadrant, a higher than normal incidence of posterosuperior tears appear in the Asian population due to a higher tendency toward hyperflexion or squatting motions.The most common mechanism is an external rotation force in a hyperextended position. Microtrauma is believed to be responsible for labral lesions in cases where pain develops gradually. Women, runners, professional athletes, participants in sports that require frequent external rotation and/or hyperextension are at increased risk of a hip labral tear. Orbell and Smith (2011) note that the incidence of labral tears differ depending on the specific etiology. Trauma: This can occur due to a shearing force associated with twisting or falling, mis-stepping on uneven ground or colliding with bicycles or vehicles. Repetitive hip hyperextension and external rotation (e.g. during terminal stance in running) can create stress at the chondrolabral junction (typically the 10-12 o'clock position) resulting in microtrauma and eventual labral injury. It may also be associated with iliopsoas impingement resulting in labral injury at the 3 o'clock position. Capsular Laxity: This is thought to occur in one of two ways; cartilage disorders (e.g. Ehlers-Danlos syndrome) or rotational laxity resulting from excessive external rotation. These forces are often seen in certain sports including ballet, hockey and gymnastics. Hip Dysplasia: Certain abnormalities of the femur. acetabulum or both (e.g. shallow acetabulum, femoral or acetabular anteversion, decreased head offset or perpendicular distance from the center of the femoral head to the axis of the femoral shaft) can lead to inadequate containment of the femoral head within the acetabulum, placing increased stress into the anterior portion of the hip joint resulting in impingement and possible tears over time. Labral tears can be classified in different ways. Anterior tear The pain will generally be more consistent and is situated on the anterior hip (anterosuperior quadrant) or at the groin. They frequently occur in individuals in European countries and the United States. Posterior Are situated in the lateral region or deep in the posterior buttocks. They occur less frequently in individuals in European countries and the United States, but are more common in individuals from Japan. There is some variation in the presentation of hip labral tears. Patients frequently present with anterior hip and groin pain, although less common areas of pain include anterior thigh pain, lateral thigh pain, buttock pain and radiating knee pain. The majority of patients (90%) diagnosed with acetabular labral tears have had complaints of pain in the anterior hip or groin. This can be an indication for an anterior labral tear, whereas buttock pain is more consistent with posterior tears and less common. Mechanical symptoms associated with a tear are clicking, locking, popping, giving way, catching and stiffness. The significance of these signs is questionable. Patients often describe a dull ache which increases with activities such as running, brisk walking, twisting movements of the hip or climbing stairs. These specific manoeuvres may cause pain in the groin; 1) Flexion, adduction, and internal rotation of the hip joint are related to anterior superior tears and 2) Passive hyperextension, abduction, and external rotation are related to posterior tears. Functional limitations may include prolonged sitting, walking, climbing stairs, running, and twisting/pivoting. The symptoms can have a long duration, with an average of greater than two years. The patient may report experiencing an audible pop or a sensation of subluxation at the time of the trauma, if there was a specific traumatic onset. According to Heerey et al (2018), hip pain is poorly correlated with intra-articular hip joint pathology seen on diagnostic imaging. In their systematic review, they found that the prevalence of cartilage pathology, bone marrow lesions, ligamentum teres tears was higher in symptomatic individuals than asymptomatic individuals, whereas the prevalence of labral pathology, paralabral cysts and herniation pits was similar in both groups. When diagnostic imaging is utililized, MR arthrogram has typically been preferred over MRI because it has shown greater accuracy in identifying defects in the labrum and cartilage. However, more recent research suggests that 3T MRI is at least equivalent to 1.5T MRA for detecting these types of defects. ***Diagnosed should be aided by physical examination of a patient. In some cases the first signs can be spotted while observing the patient; during a brief walk, the ipsilateral knee may be used to absorb the shocks created in ground reaction forces thus presenting with a flexed knee gait. Additionally related to gait, the step length of the affected leg may also be shortened, again to reduce the nociceptive input caused by walking. Aside from simple observation there are a number of provocative tests that can be performed. Because each test stresses a particular part of the acetabular labrum, they can also give an indication of where the tear is located. Labral tears can be difficult to differentiate from FAI and the two conditions can be present simultaneously. Pain from an isolated labral tear may be associated with hip extension (compared to hip flexion for FAI) as well as signs of laxity. Tightness in iliopsoas or pain with resistance testing of iliopsoas may indicate iliopsoas impingement with is associated with labral tearing but not FAI. However,even if differentiating the two conditions remains difficult following physical examination, Heiderscheit and McClinton (2016) note that initial management of the two is the same. Strong evidence in support of provocative clinical tests for diagnosing hip labral disorders is lacking. Reiman et al (2015) conducted a systematic review to evaluate the clinical accuracy of several provocative tests. They found that most of the tests were predominantly sensitive but not specific and that none was capable of significantly shifting the post-test probability of a diagnosis of acetabular labral tear. In addition, the studies that were investigated in the review were of low quality and were at risk of bias. The authors noted the need for better quality studies in patients with and without hip pathology to evaluate the true clinical utility of these tests. According to a 2008 study by Martin et al, symptoms of groin pain, catching, pinching pain with sitting, FABER test, flexion-internal rotation, adduction impingement test and trochanteric tenderness were found to have low sensitivities (.6-.78) and low specificities (.10-.56) in identifying patients with intra-articular pain. Other tests found to have high specificities but lacking high-quality study designs and supportive literature include the Flexion-Adduction-Axial Compression test and palpation to the greater trochanter. Flexion-Internal Rotation-Axial Compression test, Thomas test, Maximum Flexion-External Rotation Test and Maximum Flexion-Internal Rotation Tests were found to have poor diagnostic measures. McCarthy test, The affected hip needs to be brought into extension. If this movement reproduces a painful click, the patient is suffering from a labral tear. Anterior labral tear, the patient's leg has to be brought into full flexion, lateral rotation and full abduction. Then the leg has to be extended with medial rotation and adduction. Patients with an anterior labral tear will experience sharp catching pain and in some cases there might be a "clicking" of the hip. Posterior Labral tear, is identified by bringing the patient's leg into extension, abduction and lateral rotation followed by an extension with medial rotation and adduction of the leg. Sharp catching pain with or without a "click" will be an indication for a posterior labral tear. Fitzgerald Test. The Fitzgerald test utilizes two different test positions to determine if the patient has an anterior or posterior labral tear. To test for a anterior labral tear, the patient lies supine while the physical therapist (PT) performs flexion, external rotation, and full abduction of the hip, followed by extending the hip, internal rotation, and adduction. To test for a posterior labral tear, the PT performs passive extension, abduction, external rotation, from the position of full hip flexion, internal rotation, and adduction while the patient is supine. Tests are considered to be positive with pain reproduction with or without an audible click. The Fitzgerald test has a sensitivity of .98. The most common treatment and usually the first step on the treatment ladder is conservative treatment and medication (NSAIDs). When conservative treatment does not resolve symptoms, surgical intervention may be appropriate. The most common procedure is an excision or debridement of the torn tissue by joint arthroscopy. However, studies have demonstrated mixed post-surgical results. Fargo et al found a significant correlation between outcomes and presence of arthritis on radiography. Only 21% of patients with detectable arthritis had good results from surgery, compared with 75% of patients without arthritis. Arthroscopic detection of chondromalacia was an even stronger indicator of poor long-term prognosis. For a simple tear, surgery involves a bioabsorbable suture anchor being placed over the tear to stabilize the fibrocartilaginous tissue back onto the rim of the acetabulum when the labrum has detached from the bone. If the pathology is caused due to a malalignment (e.g. Perthes or hip dysplaysia), femoral or pelvic osteotomies are considered. A femoral osteotomy is a surgical treatment where the femur is cut and angled differently in an attempt to improve the mechanics of the leg. Repair of the acetabular labral lesion can be preformed in either the supine or lateral position. In the supine position, a stand fracture table is used with an oversized perinal post to apply traction. The affected hip is placed into slight extension/adduction to allow approach to the joint. During traction it is important that there is a minimized pressure in the perineal area to avoid neurologic complications. The procedure is under the guidance of fluoroscopy. If the distraction is obtain a 14 or a 16 gauge spinal needle is inserted into the joint to break the vacuum seal and allow further distraction. Three portals are used (the anterolateral, anterior and the distal lateral accessory). For repair of a detached labrum, the edges of the tear are delineated and suture anchors are placed on top of the acetabular rim in the area of detachment. If the tear in the labrum has a secure outer rim and is still attached to the acetabulum, a suture in the mid substance of the tear can be used to secure. When conservative management is unable to control the patient’s symptoms, surgical intervention may be considered. Movements that cause stress in the area need to be avoided. The rehabilitation protocol following acetabular labral debridement or repair are divided into four phases. The primary goals following a acetabularlabral debridement or repair are to the minimize pain and the inflammation, and initiate early motion exercises. This phase initially consists of isometric contraction exercises for the hip adductors, abductors, transverse abdominals and extensor muscles. Following a labral debridement, closed-chain activities such as low-level leg press or shuttle can begin with limited resistance. Weight bearing protocol following a debridement is 50% for 7 to 10 days, and non-weight bearing or toe-touch weight bearing for 3 to 6 weeks in case of a labral repair. Unnecessary hypomobility will limit progress in future phases, thus it is important to ensure that the patient maintains adequate mobility and range during this phase. Aquatic therapy is a suitable treatment approach - movement in the water allows for improvement in gait by allowing appropriate loads to be placed on the joint without causing unnecessary stress to the healing tissue. For example, the patient may perform light jogging in the water using a flotation device. It is import to know that the patient's range of motion precautions, as these may vary in debridement or repair. Manual therapy for pain reduction and improvement in joint mobility and proprioception. Considerations include gentle hip joint mobilizations contract-relax stretching for internal and external rotation, long axis distraction, and assessment of lumbo-sacral mobility. Appropriate pain management through medication. Gentle stretching of hip muscle groups including piriformis, psoas, quadriceps, hamstring muscles with passive range of motion. Exercises such as: water walking, piriformis stretch, ankle pumps. To progress to phase 2, ROM has to be greater or equal to 75%. 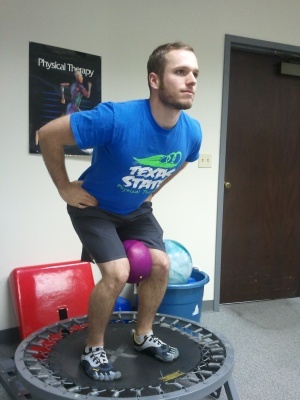 The goal of this phase is to continue to improve ROM and soft tissue flexibility . Manual therapy should continue with mobilization that is more aggressive, passive ROM exercises should become more aggressive as needed, for external- and internal rotation. 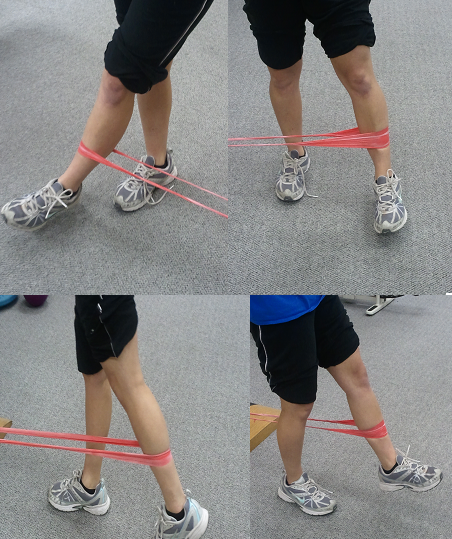 To progress to the third phase it is important that the patient has a normal gait pattern with no Trendelenburg sign. The patient should have symmetrical and passive ROM measurement with minimal complaints of pain. Strengthening exercises: walking lunges, lunges with trunk rotations, resistend sportcord, walking forward/backwards, plyometric bounding in the water. To progress to the forth phases it is important that there is symmetrical ROM and flexibility of the psoas and piriformis. In this phase it is important to return safely and effectively back to competition or previous activity level. Manual therapy, flexibility, and ROM exercises can continue as appropriate. It is important the the patient has good muscular endurance, good eccentric muscle control, and the ability to generate power. The patient can be given sport specific exercises and has to have the ability to demonstrate a good neuromuscular control of the lower extremity during the activities. Reducing anteriorly directed forces on the hip by addressing the patterns of recruitment of muscles that control hip motion and by correcting movement patterns during exercises such as hip extension and during gait . As these patients have abnormal recruitment patterns of the hip muscles due to the biomenchanics of the pathology, treatment should optimize control of these muscles, specifically the hip adductors, deep external rotators, m. gluteus maximus, and m. iliopsoas muscles . Additionally, if m. quadriceps femoris and hamstring muscles dominate, this should be corrected, as decreased force contribution from the m. iliopsoas during hip flexion and from the gluteal muscles during active hip extension results in greater anterior hip forces. Through gait and foot motion analysis, any abnormalities such as knee hyperextension causing hip hyperextension, walking with an externally rotated hip, or stiffness in the subtalar joint can be analysed and can be corrected through taping, orthotics or strengthening . Gait analysis may also uncover decreased hip abduction during both the stance and swing phase, as well as decreased hip extension during swing phase -- characteristics that may be part of a hip joint stabilization strategy used by patients to compensate for deficient hip musculature functionality. Additionally, patients need to be educated regarding modification of functional activities to avoid any positions that cause pain, such as sitting with knees lower than hips or with legs crossed, getting up from a chair by rotating the pelvis on a loaded femur, hyperextending the hip while walking on a treadmill, etc. After addressing abnormal movement patterns, focused muscle strengthening work and recovery of normal range of motion, patients eventually need to be progressed to advanced sensory-motor training and functional exercises, sport specific if applicable. ↑ 1.0 1.1 Lewis CL, Sahrmann SA. Acetabular Labral Tears. Phys Ther 2006;86:110-121. ↑ Amber I, Mohan S. Preventing Overdiagnosis of Acetabular Labral "Tears" in 40-Plus-year-old Patients: Shouldn't these be called Labral "Fissures" Instead? Acad Radiol. 2018;25(3):387-390. ↑ Lewis C, Sahrmann S. Acetabular labral tears. Physical Therapy. 2006;86(1):110-121. ↑ 5.0 5.1 5.2 Burgess RM, Rushton A, Wright C, Daborn C. The validity and accuracy of clinical diagnostic tests used to detect labral pathology of the hip: A systematic review. Manual Therapy 16 (2011) 318 – 326. ↑ 8.0 8.1 8.2 8.3 8.4 8.5 8.6 8.7 Leiboid M, Huijbregts P, Jensen R. Concurrent Criterion-Related Validity of Physical Examination Tests for Hip Labral Lesions: A Systematic Review. The Journal of Manual Manipulative Therapy. [online]. 2008;16(2):E24-41. ↑ 9.0 9.1 9.2 9.3 9.4 9.5 9.6 9.7 Groh MM, Herrera J. A comprehensive review of hip labral tears. Current reviews in musculoskeletal medicine. 2009 Jun 1;2(2):105-17. ↑ 10.0 10.1 Orbell S, Smith TO. The physiotherapeutic treatment of acetabular labral tears. A systematic review. Adv Physiother. 2011; 13: 153-161. ↑ 11.0 11.1 11.2 11.3 11.4 11.5 11.6 Heiderscheit B, McClinton S. Evaluation and Management of Hip and Pelvis Injuries. Phys Med Rehabil Clin N Am. 2016;27(1):1-29. ↑ 12.0 12.1 McCarthy JC, Noble PC, Schuck MR, et al. The Otto E. Aufranc Award: the role of labral lesions to development of early degenerative hip disease. Clin Orthop 2001;393:25–37. ↑ O’Leary JA, Berend K, Vail TP. 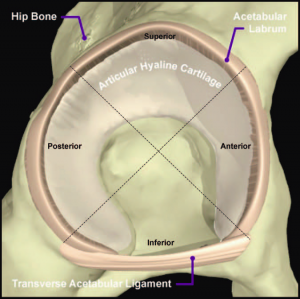 The relationship between diagnosis and outcome in arthroscopy of the hip. Arthroscopy 2001;17:181–188. ↑ 14.0 14.1 Byrd JW. Labral lesions: an elusive source of hip pain case reports and literature review. Arthroscopy 1996;12:603–612. ↑ Binningsley D. Tear of the acetabular labrum in an elite athlete. Br J Sports	Med 2003;37:84–88. ↑ 16.0 16.1 Hase T, Ueo T. Acetabularlabral tear: arthroscopic diagnosis and treatment. Arthroscopy 1999;15:138 –141. ↑ Klaue K, Durnin CW, Ganz R. The acetabular rim syndrome: a clinical presentation of dysplasia of the hip. J Bone Joint Surg Br 1991;73:423– 429. ↑ 20.0 20.1 20.2 20.3 20.4 20.5 20.6 20.7 20.8 20.9 Lewis CL, Sahrmann SA. Acetabular labral tears. Physical therapy. 2006 Jan 1;86(1):110-21. ↑ Narvani AA, Tsiridis E, Tai CC, Thomas P. Acetabular labrum and its tears. Br J Sports Med 2003;37:207-211. ↑ Farjo LA, Glick JM, Sampson TG. Hip arthroscopy for acetabular labral tears. Arthroscopy 1999;15:132–137. ↑ 23.0 23.1 23.2 Schmerl M, Pollard H, Hoskins W. “Labral injuries of the hip: a review of diagnosis and management.” J Manipulative Physiol Ther. 2005;28(8):632. ↑ 24.0 24.1 Heerey JJ, Kemp JL, Mosler AB, Jones DM, Pizzari T, Souza RB et al Crossley KM. What is the prevalence of imaging-defined intra-articular hip pathologies in people with and without pain? A systematic review and meta-analysis. Br J Sports Med. 2018;52(9):581-593. ↑ 25.0 25.1 Chopra A, Grainger AJ, Dube B, Evans R, Hodgson R, Conroy J et al. Comparative reliability and diagnostic performance of conventional 3T magnetic resonance imaging and 1.5T magnetic resonance arthrography for the evaluation of internal derangement of the hip. Eur Radiol. 2018 Mar;28(3):963-971. ↑ 26.0 26.1 26.2 Reiman MP, Goode AP, Cook CE, Hölmich P, Thorborg K. Diagnostic accuracy of clinical tests for the diagnosis of hip femoroacetabular impingement/labral tear: a systematic review with meta-analysis. Br J Sports Med. 2015;49(12):811. ↑ Lewis CL, Sahrmann SA. “Acetabular labral tears.” Physical Therapy. 2006;86:110–21. ↑ Ayeni, O. R., Alradwan, H., de Sa, D., & Philippon, M. J. (2014). The hip labrum reconstruction: indications and outcomes—a systematic review. Knee Surgery, Sports Traumatology, Arthroscopy, 22(4), 737-743. ↑ Troelsen A, Mechlenburg I, Gelineck J, Bolvig L, Jacobsen S, Søballe K. What is the role of clinical tests and ultrasound in acetabular labral tear diagnostics? Acta Orthop 2009 Jun;80(3):314-8.